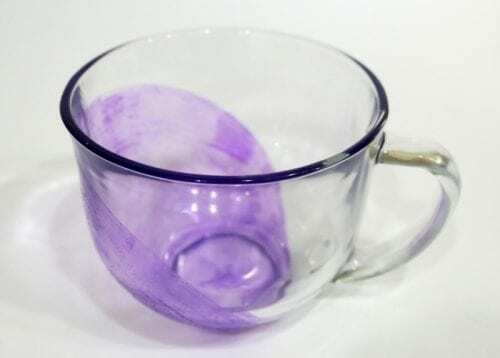 Learn how to paint coffee mugs permanently using transparent glass paint! Makes a great handmade gift. 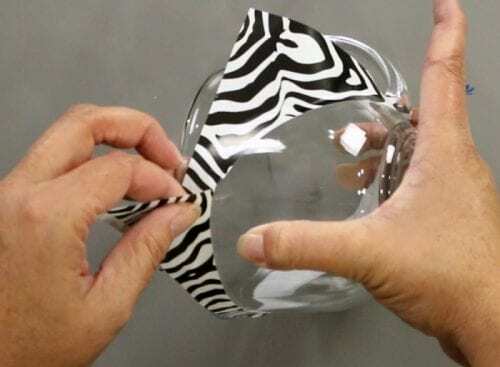 Includes a step by step video tutorial! Some of the supplies for this post have been provided by Deco Art. All opinions are mine alone. Have you ever added a personalized touch to a cup? It is really much easier than you may think and it is so much fun! These cups came from the dollar store and I absolutely love the shape! The only thing they need is a bit of color! Supplies Used: Affiliate links below may be to similar items when exact items couldn’t be found online. 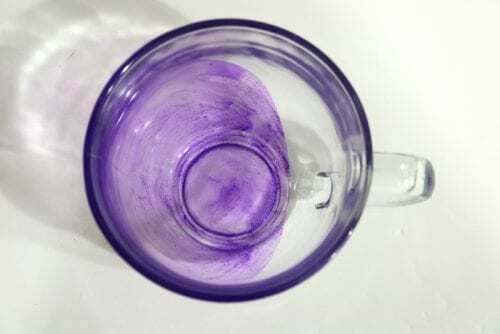 There are several different types of glass paints that you can use from Americana, and I have a post to help you decide! 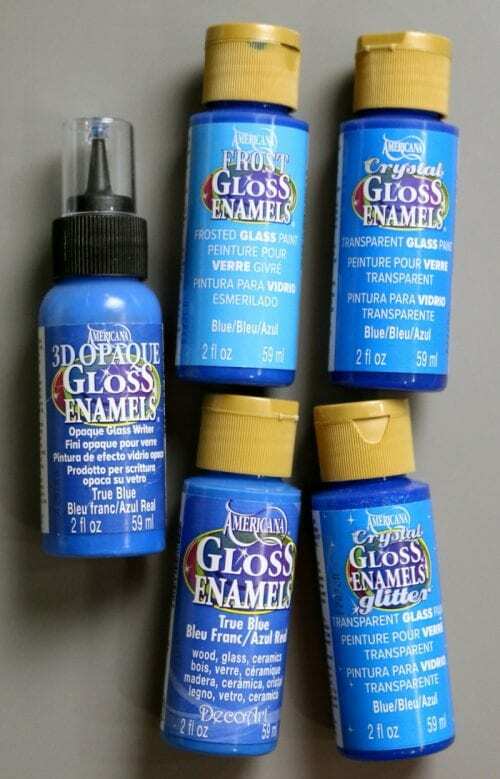 What Glass Paint to Use when Painting on Glass. First, cut your circle template out of vinyl. I used my Cricut Explore, but the shape is simple enough that you could also trace a plate or something round onto a piece of vinyl and cut by hand. My circle has a diameter of 7.5-inches. The circle is larger than needed but the extra size gives me some wiggle room when applying the stencil. 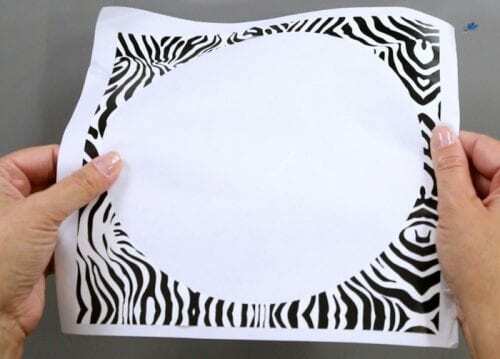 Remove the circle stencil from its paper backing sheet and begin to wrap around the base of the cup. I wanted the circle to lay where it looked like something was tipped in the glass, circle low on one end and high on the other. Wrap around until the edges of the stencil come together, making sure there aren’t any points or weird angles at that intersection. Before painting clean the glass with some rubbing alcohol and a lint-free cloth. 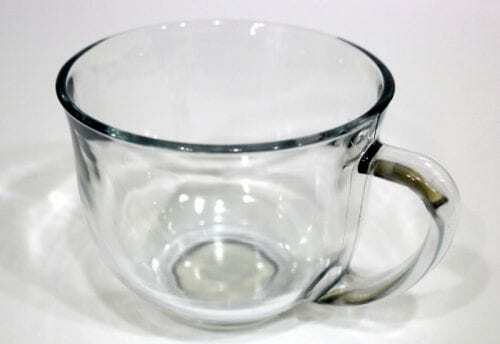 This will remove any oil smudges from your fingers and make sure the glass is nice and clean. Apply the Gloss Enamels paint inside the circle template. Let the paint dry for 4 days. For a dishwasher-safe finish, place the finished pieces in a cool oven, set the temperature to 275°F and bake for 30 minutes, then cool with oven door partially open. The different paints have a different temperature so make sure to double check the directions on the bottle for the correct baking temperature and time. When all steps are completed you have some super fun glass painted cups that match your style and personality perfectly! I made two cups using the same technique. The first used Turquoise Frost Gloss Enamel and the second used Purple Crystal Gloss Enamel Glitter. Now I guess I have to invite someone over for coffee or hot chocolate so I can show off my Glass Painted Cups! 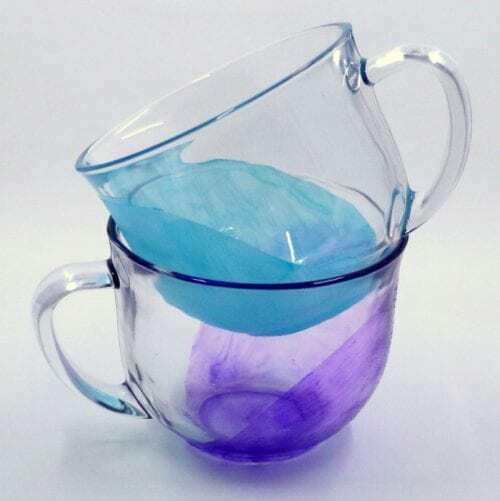 What colors will you use when making your glass painted cups? Share and leave a comment below! 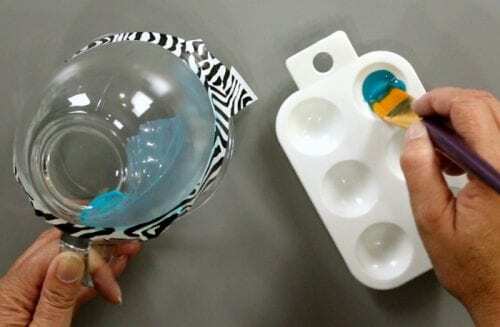 SAVE HOW TO MAKE GLASS PAINTED CUPS TO YOUR FAVORITE DIY PINTEREST BOARD! What a really great and creative way to turn boring glasses and cups into real show stoppers! Thank you! Thanks, Jeannee! It was a fun project to make! You are so clever Katie! Thank you for sharing the lovely idea to put some pop into everyday cups and saucers. Great to have you link up with us at #OvertheMoon. Pinned and shared. Thanks, Sue! 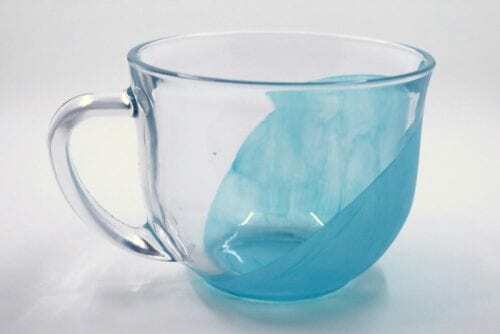 I am so glad you like my glass painted cups. Hi Fie, thanks for your kind words. It warms my heart that you have been inspired to makes some projects from my blog. IF you want to start a blog you should totally do it! IT si such a great outlet. But you can’t compare your blog, style, and content to anyone else because you aren’t them, and they aren’t you. I just passed my 6-year blog anniversary so I have 6 years to learn and grow, and yours will do the same. When you start your blog I’d love for you to stop by and drop a link so I can check it out. I’m excited to see it!